The EarlyTox™ Cell Integrity Kit enables the differentiation of live cells from dead cells via fluorescent labeling. This is useful for the rapid quantification of cell viability when used with the Molecular Devices SpectraMax® MiniMax™ 300 Imaging Cytometer or other fluorescence-based cellular imaging instruments. The EarlyTox Cell Integrity Kit is an optimized set of reagents that simplifies the identification of live and dead cells. It can be used to measure the effects of different treatments on cell viability and to evaluate toxic effects mediated through a variety of mechanisms, including apoptosis and necrosis. The kit is designed to work with many cell types, both adherent and non-adherent. The protocol’s simple workflow and reagent performance make it amenable to high-throughput screening. 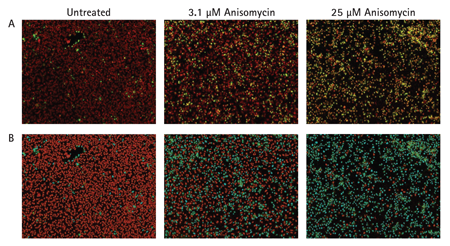 Figure 1: (A) Untreated cells (left panel) are mostly alive, with red fluorescent nuclei. At an intermediate concentration of compound (center panel), there is a mixture of live and dead cells. At high compound concentration (right panel), most cells are dead, with nuclei labeled both red and green. Images were acquired on the SpectraMax® MiniMax™ 300 Imaging Cytometer. 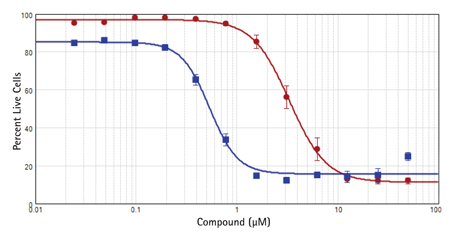 (B) Cells were identified as live (red masks) or dead (blue masks) using the Classification feature in SoftMax® Pro Software. Figure 2: HeLa cells were treated with anisomycin (red circles) or staurosporine (blue squares). Results were plotted using the 4-parameter curve fit in SoftMax® Pro software. IC50 for anisomycin was 3.3 μM, and IC50 for staurosporine was 0.53 μM; both values were consistent with published values. 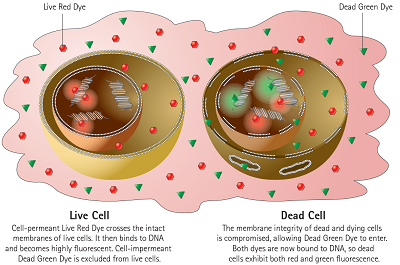 EarlyTox Cell Integrity Kit uses two nuclear dyes that allow users to detect changes in outer cell membrane permeability resulting from cell damage or cell death via necrosis, apoptosis, or other mechanism. Cell viability is assessed by counting the number or percent of live and damaged cells. The assay can be used for studies of the effects of different treatments on cell viability, evaluation of toxicity effects of pharmaceutical compounds or other chemicals, studies of necrosis and apoptosis, and many other applications.